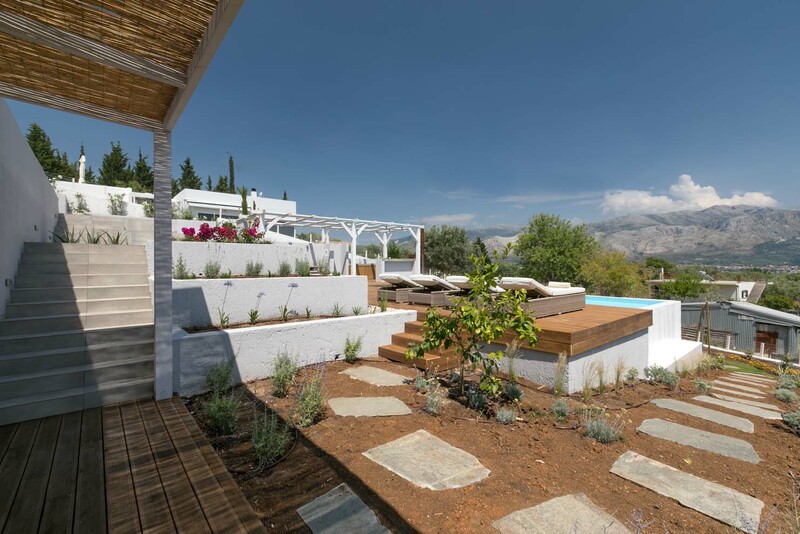 Villa Elia is located high above the bay of Paleros and surrounded by olive groves. The sea is so close that you only have to walk for a few minutes to reach the beach. 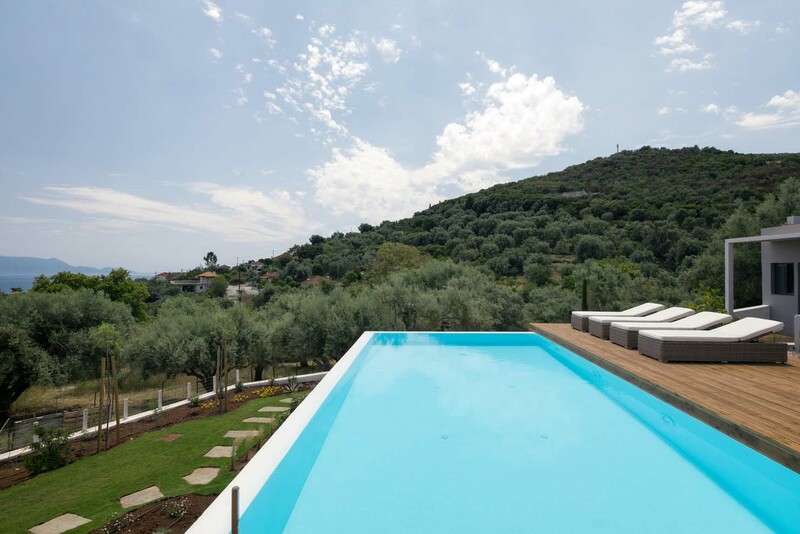 The view is stunning with the turquoise Ionian sea together with the lush green backdrop of the Arcadian Mountains. 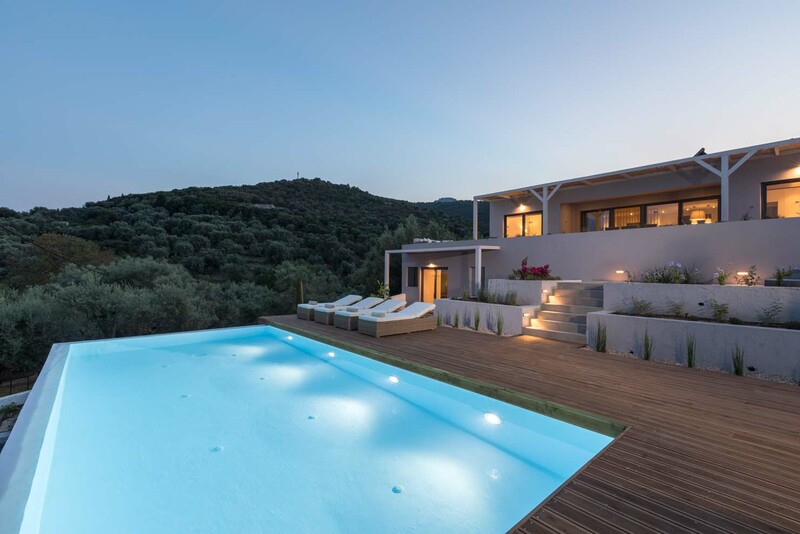 Upon entering this unique, modern villa, you are immediately greeted with fantastic views of the villa, its exceptionally large pool and beyond. Fully equipped kitchen with breakfast bar and 2 large double bedroom each with ensuite and sliding patio doors leading out to the veranda. Lower level is a further bedroom with sliding doors opening out to the garden. The living area is spacious and open. A lounge area with coffee table provides a comfortable area for relaxing and a dining area that comfortably sits 6 people. 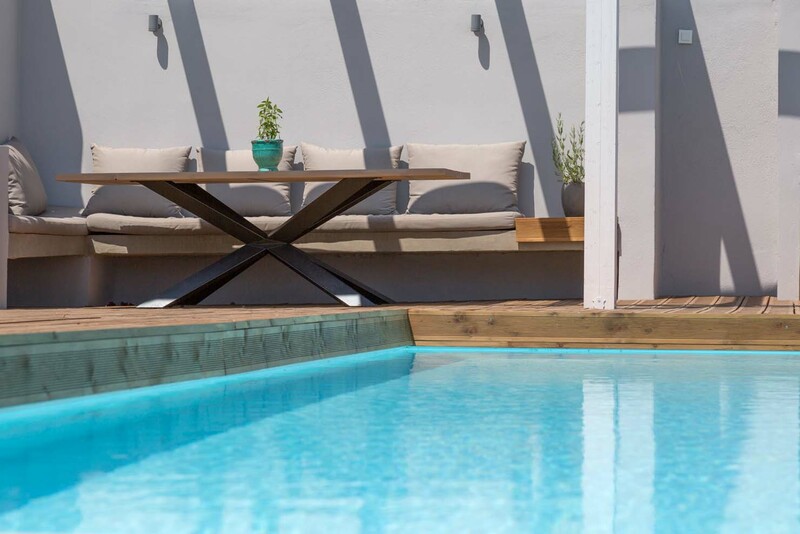 This has a lounging area in the corner and a dining table that seats 8 in the center. .
Large, stylish tiling takes you down a few steps to the large 5 x 10m pool which There are teak sun loungers surrounding the pool, and at the side, a covered lounging area. 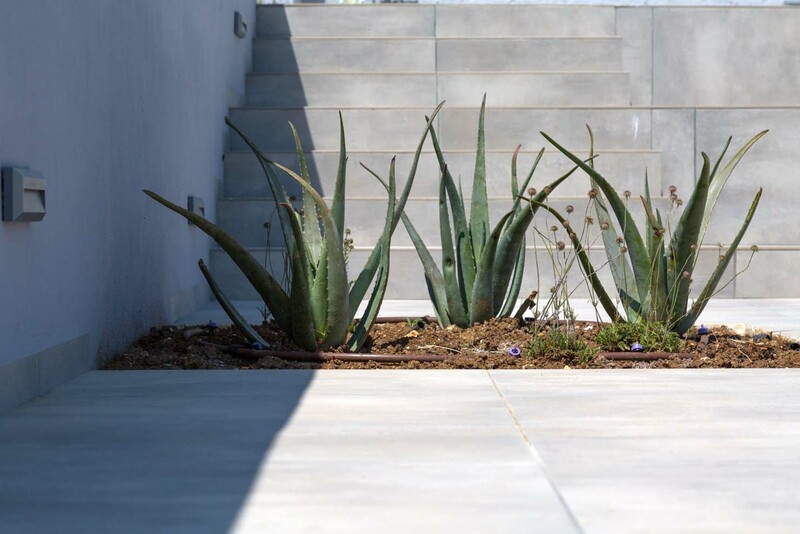 Beyond this outdoor living area are more steps leading down to a beautiful, well maintained landscaped garden. large glass doors open out to the patio, and pool. Master double bedroom with en suite. Glass sliding doors leading to the decking area. En suite bedroom with double bed. 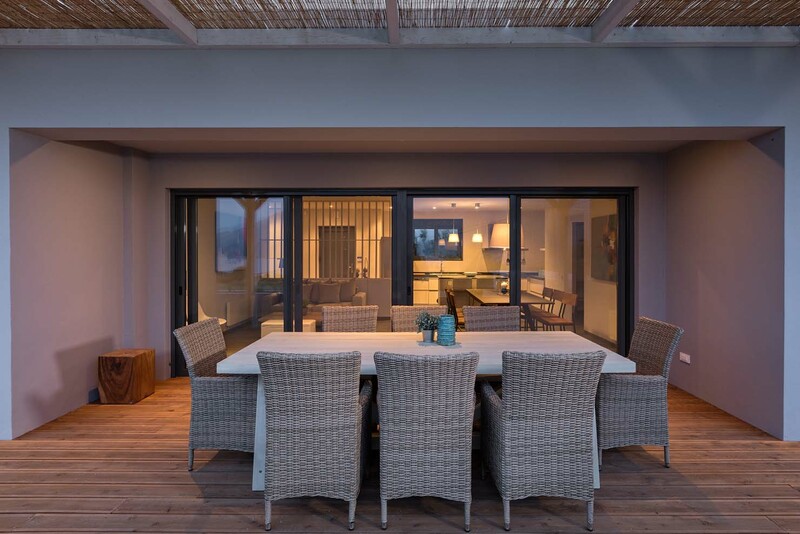 Glass sliding doors opening out onto the decking. Glass sliding doors opening out onto a garden with steps leading to the pool, to the lounging area and to the garden. 10m x 5m swimming pool. 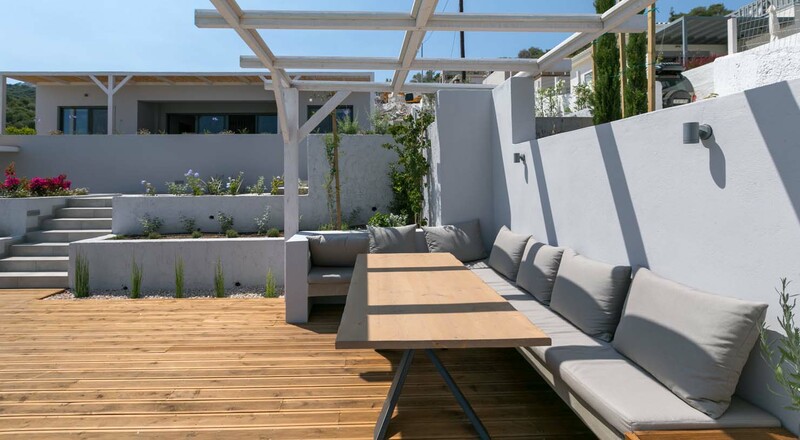 Spacious outdoor living space with 2 seating areas. Pogonia, a picturesque village located on the west coast of mainland Greece, is situated in a breathtaking backdrop of beautiful and serene vistas and the crystal clear waters of the Ionian sea. Olive trees, vineyards and pine trees extend down to sandy beaches. Local tavernas,cafe and a bakery are within walking distance. In Paleros town at 4 Km from the villa there are supermarkets, bank ATM’s, car, bike & boat rentals, several tavernas, cafe, bars and in general nightlife. There is also a modern beach bar & restaurant, Yacht Club Paleros, with teak sunbeds, wood oven pizzas and very nice local food, nice cocktails, ice cream from fresh milk and usually our clients spent there a lot of time. The conditions are excellent for all water sport activities. Cross onshore winds blow gently into the protected bay making it ideal for swimming, fishing, sailing, scuba diving, canoe-kayaking, and water-skiing in lake-like conditions. The Ionian sea is particularly popular for diving and it takes just a short swim under water to discover the marvelous wealth and unique beauty of these waters. Moreover, the two marinas in Paleros provide all the supportive facilities for yachts and sailboats. 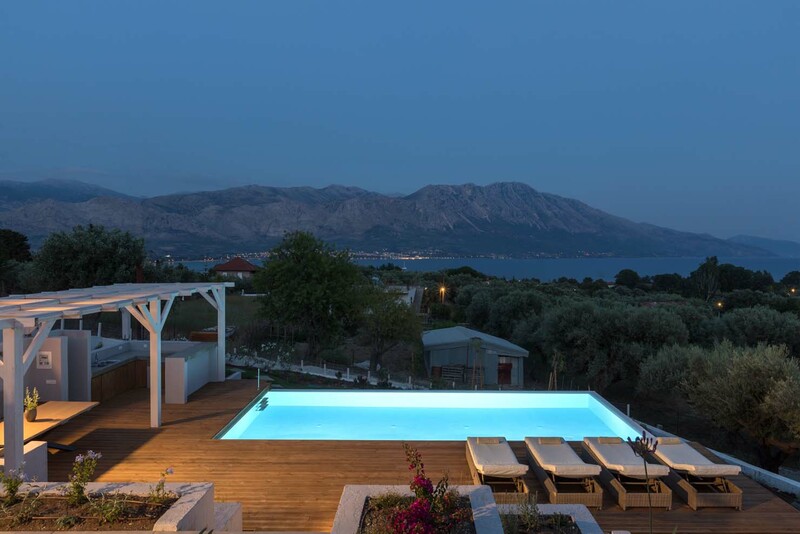 It is strategically located making it ideal for short excursions to the adjacent island of Lefkada, separated from the mainland by a floating bridge just 50m long. Preveza, Parga and many other places can also be reached easily by car offering wonderful destinations for daily excursions. Paleros Bay is ideal to discover the Ionian sea with amazing beaches and the islands of Lefkada, Kefalonia, Ithaca, Kalamos, Kastos, Atokos and the famous Onassis owned Scorpios. Private boat for day cruises is available upon request.The Aktio-Preveza International airport is less than a 30 minute drive making Infinity Blue easily accessible. Paleros existed form the antiquity. Ancient Paleros is a place of beauty and grace, situated high in the mountains overlooking the Ionian sea and Vourkaria lake. The city had a population of over 10,000 people and was the location of one of the most important battles of antiquity. At nearby Aktio, Antony and Cleopatra were defeated in a sea battle by Octavius, who built the city of Nikopolis to commemorate his victory and moved the population of Paleros to his new city in 31 B.C.